Taraz Technologies is a high-quality PCB supplier based in Pakistan. Our PCBs are manufactured by a partner factory in China. With more than half a decade of PCB services experience, we provide the fastest delivery with shortest lead time and high quality. We also offer one stop Electronics Manufacturing Services such as PCB Assembly, SMT-Stencil and Component Sourcing. 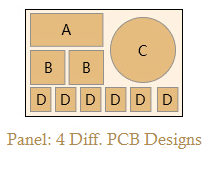 Maximum PCB Size (Dimension) 500×1100 mm We offer a maximum card size of 500×1100 mm. Board Thickness Range 0.4-2.4mm Customer can choose from following options 0.4, 0.6, 0.8, 1.0, 1.2, 1.6, 2.0, 2.4mm. 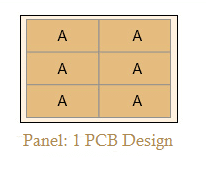 Board Thickness Tolerance (t≥1.0mm) ±10% The “+ Tolerance” case would occur because of PCB processing steps such as electroless copper, solder mask and other types of surface finish. Min Trace 0.1mm/4mil Min trace offered is 4mil(0.1mm). However, default track size is 6mil(0.15mm) and any other track size would cost extra. Min Spacing Min spacing offered is 4mil(0.1mm). However, default spacing is 6mil(0.15mm) and any other spacing would cost extra. Outer Layer Copper Thickness 1oz/2oz/3oz(35μm/70μm/105μm) 35μm=1oz, 70μm=2oz, 105μm=3oz. Drill Sizes (CNC) 0.2-6.3mm Default hole size is 0.30mm and hole size less then 0.30mm would cost extra . Finished Hole Diameter (CNC) 0.2mm-6.2mm Due to copper plating in hole barrels, the finished hole diameter will be less than size of drill bits. Finished Hole Size Tolerance (CNC) ±0.08mm A margin of ±0.08mm would be acceptable i.e if the drill size is 0.40mm, the finished hole diameter ranges would range between 0.32mm – 0.48mm. Liquid Photo-Imageable is usually used as Solder mask while paper-based boards are printed using Thermosetting Ink. Minimum Character Width (Legend) 0.15mm Characters below 0.15mm width would be extremely narrow to read. Minimum Character Height (Legend) 0.8mm Characters below 0.80mm height would be extremely small to read. Character Width to Height Ratio (Legend) 1:5 Character width to height ratio of 1:5 is adopted while silkscreen printing. Immersion gold Default HASL with lead surface finishing. Default Green colour is used for solder mask. Silkscreen White, Black, None No extra charge. Tab-routing,Tab-routing with Perforation (Stamp Holes) For break-routing,Leave min clearance of 1.6mm between boards. For V-score penalization, space between the boards should be zero. Submit separate forms for multiple designs and use common PO number as reference. Enter a valid design name/number which would be used as a reference for documentation such as quotations and invoices. If boundary rails are required, the rail size must be included in panel dimensions. The default rail size is 3mm. In case of Panel as Tab Routing, routing gap must be included in panel dimensions and routing gap should be 1.6mm. In case of Panel as V-Scoring, space between the boards should be zero. The default Min. trace width/clearance is 6/6mil and selection below 6mil would cause a significant increase in price. The default Min. drill hole size is 0.30mm and selection below 0.30mm would cause a significant increase in price due to change in manufacturing process (Laser drilling). Choosing any color of solder mask from specified list of colors would not cause any change in price. The default Surface finish is HASL with Lead and selecting any other surface finish would cause an increase in price. 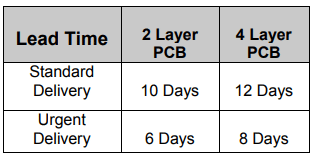 Manufacturing lead time for 2 layer PCB is 2-4 days and 4 layer PCB is 4-6 days. Standard delivery to Pakistan takes around 6 days while Urgent delivery takes around 2-4 days. Please attach Gerber files in RS-274X and drill data in NC format ONLY. Note that no other format would be accepted. For any further query, please email us at sales@taraztechnologies.com. Please visit Terms & Conditions for more information. We no longer accept PCB Manufacturing orders due to import restriction, We apologize for the inconvenience caused. PCB manufacturing Pakistan, PCB manufacturing Pakistan. PCB Manufacturing Services in Pakistan, Best PCB Manufacturer in Pakistan, Pakistan PCB manufacturing Companies, Low cost High quality PCB Manufacturing Services in Pakistan, Fast PCB Prototyping in Pakistan, Reliable PCB Manufacturer in Pakistan. Pakistan’s Largest PCB Manufacturer, PCB Manufacturing Online Calculator, PCB Manufacturing Online Estimator, PCB Manufacturing online Price, Printed Circuit Board Manufacturer.PCB Manufacturing Services in Pakistan, Best PCB Manufacturer in Pakistan, Pakistan PCB manufacturing Companies, Low cost High quality PCB Manufacturing Services in Pakistan, Fast PCB Prototyping in Pakistan, Reliable PCB Manufacturer in Pakistan. Pakistan’s Largest PCB Manufacturer, PCB Manufacturing Online Calculator, PCB Manufacturing Online Estimator, PCB Manufacturing online Price, Printed Circuit Board Manufacturer. PCB manufacturing Pakistan, PCB manufacturing Pakistan, PCB manufacturing Pakistan.